LEAP: Learn, Explore and Play! 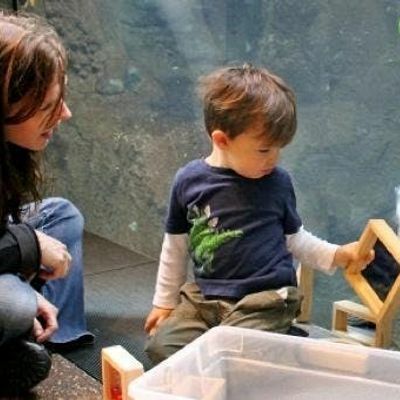 Saturdays, March 23 - May 18, 20199:30–10:30 a.m.
Join us for a morning of investigating and exploring the natural world through play. Children guide the way as they choose whether to dig in the dirt, manipulate loose parts, create a collaborative work of art or settle in with a story underneath a canopy of colorful fabric. Learn and grow together as you play alongside a wondrous world of animals in Regenstein African Journey and Pritzker Family Children's Zoo. Wrap up your monring with the group by reading a story or taking a nature walk. The allowed adult to child ratio for each class is up to two adults to one child. You are welcome to bring children who are 12 months or younger at the start of class to an older sibling’s class at no additional charge, as long as you are able to keep them on your person or in a stroller for the duration of the class. Children older than 12 months must wait until they reach 2 years old to attend. LEAP is a nut-free program. Due to the prevalence of allergies we ask that any snacks you consume during LEAP class do not contain nuts; this includes peanuts as well as tree nuts such as almonds, cashews, walnuts, pine nuts, etc. Program materials provided by LPZ staff will not contain nuts.Please note that parking is not included. Lincoln Park Zoo adheres to a strict cancellation and refund policy. If for any reason you need to cancel your registration before the deadline above, a refund will be issued, less a 12.5 percent processing fee. After the deadline above, Lincoln Park Zoo will not offer any refunds for cancelled registrations. For more information, contact bGVhcm5pbmcgfCBscHpvbyAhIG9yZw== or 312-742-2056.